I've put the slides up on flickr. Enjoy! P.S. 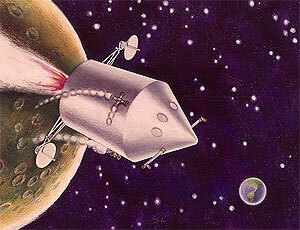 If you happen to be a NASA historian, I'd love it if you could shed any light on this little bit of science history. First Chris I would like to thank you for sharing your find! Great stuff!! Now while I might not be able to shed some light on these slides after seeing them something started nagging at me. Instead of coming from NASA how about from Disney? "Before man ventured into space, Walt Disney took the nation there. This set of the Walt Disney Treasures consists of "Science Factual" shows that aired mostly in the 1950s. On the first disc, Ward Kimball, one of the company's ace animators, directs three 50-minute segments on space travel dealing with space flight, going to the moon, and going to Mars. A combination of lecture (by the tops in the field, including lead rocket designer Dr. Werner von Braun), animation, live-action segments, and models, the three segments are still relevant as they effortlessly teach such elements as why rockets are in stages, what is gravitational force, orbiting, air pressure, and even the psychological effects on the mind. It is impressive how easily these Tomorrowland features entertain audiences of all ages. Of course, some of the details are wrong, but the wonder is not, and the final segment--a most poetic survey about what life might be like on Mars--illustrates Disney animated magic at its best." More than one of those slides look like they were in one of those 3 shows.. Something you may wana check into. Perhaps Phil at badastronomy.com could help you out? Interesting! I think there's slides from a number of different presentations here, though - there's a number of different art styles, and the wonderful 'Destructive Power' graph doesn't seem to relate to Apollo. The 'Project Mercury' slide also seems earlier than the Apollos. I have been lucky in doing some Internet research, and I believe that you have picked up some valuable collectibles from space history. Three slides that you have posted were used in a presentation by M. W. Rosen and F. C. Schwenk at the Tenth International Astronautical Congress in London, England, August 31, 1959. Chris - The old NASA glass slides are rare, but not as rare as you may think. I have been conducting Space Memorabilia auctions at Superior Galleries in Beverly Hills (now Regency Superior) since 1993 and have had boxes of similar slides at least six times over the years. They generally bring in the neighborhood of $10 per slide. I agree that they are a fascinating glimpse into the past (for those of you too young to have experienced the times yourselves), but when compared to the real rarities of space memorabilia, they are just a footnote. Regency Superior will be holding their next Space Memorabilia auction in April 2007 and it promises to be truly outstanding with a large range of flown and unflown rarities from Mercury through Shuttle. I will be glad to send you a copy of the catalog when it is published if you wish. Just let me know. PS. All publicity re space memorabilia is appreciated. Keep up the good work.